In a medium bowl, whisk together flour, cocoa, cornstarch, baking powder, baking soda, salt and sugar. 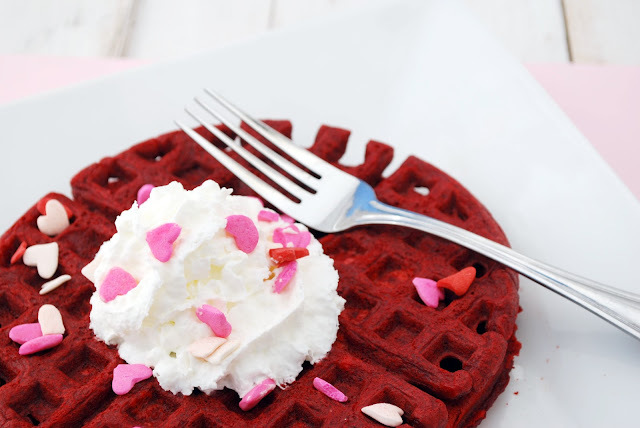 In a medium bowl, whisk together buttermilk, vegetable oil, egg, vanilla and red food coloring. Add dry ingredients and whisk until mostly smooth, with a few lumps remaining. Let rest for 30 minutes. Meanwhile, preheat waffle iron. After the 30 minutes of rest, pour batter into waffle maker taking care not to overfill. Cook to manufacturer’s instructions.